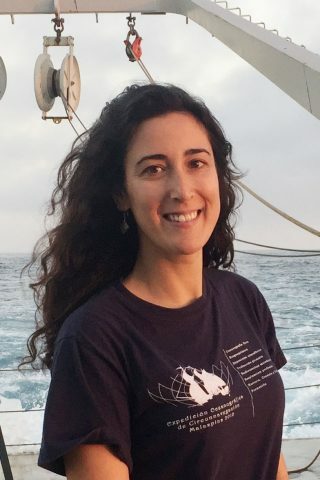 Originally from the south of Spain, Ana Cabello is now a postdoctoral scholar in Jon Zehr’s Lab at the Ocean Sciences department (University of California, Santa Cruz). She developed her thesis studies at the Institute of Marine Sciences in Barcelona (Spain), and got her PhD in Oceanography in 2016. During her PhD she was focused on the ecology of marine photosynthetic protists, particularly those belonging to the picoplankton, also called PPEs (Photosynthetic PicoEukaryotes). She is interested on the symbiosis established between the N2-fixing cyanobacteria UCYN-A and a single-cell algae, which is considered a model for studying the evolution of Nitrogen fixing organelles. Her work in Zehr’s Lab is focused on the study of the biological and physical mechanisms for the establishment of this symbiosis including ultrastructure.